The timing of the New Year on January 1 seems arbitrary, but there’s a seasonal resonance too. Maybe it is because I am culturally programmed to think of this date as the beginning of a new cycle, but it also makes sense to reflect on the past and dream about the future at this time of the year. In the north, we’ve just past the date of the longest night, a time of reflection. The hint of light returning infuses our winter dreams with anticipation for the future. In preparation for this last forecast for 2015, I’ve spent the morning looking at past transits—reflecting on the profound changes that occurred in my life and also in the world—and beginning to wonder what 2016 will bring. A huge influence this past year was the Uranus/Pluto square—a three-year transit that technically ended in March 2015. 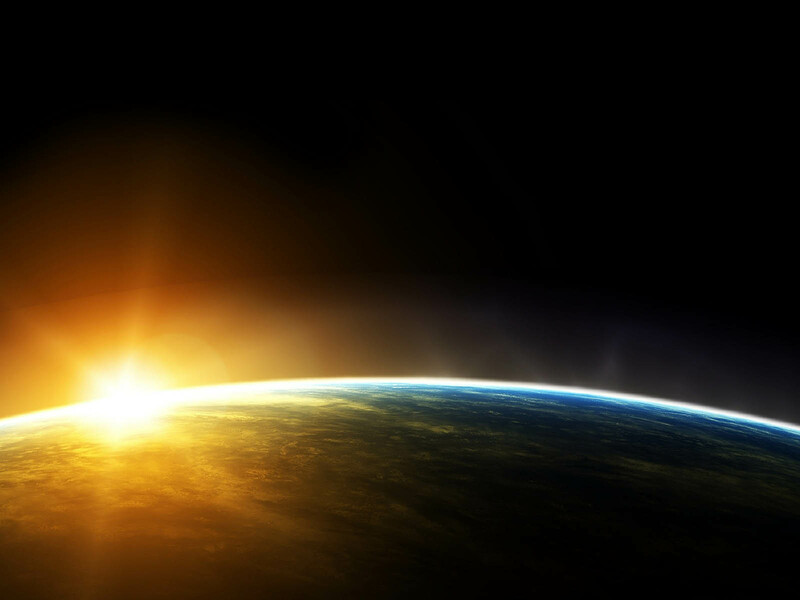 We are still under the paradigm-changing influence of these two planets in challenging aspect to each other. Check out the vision of the Great Turning for a clear description of this point in history. Many ecologically-minded thinkers, notably Joanna Macy, name the end of our dependence on oil and misuse of the Earth as the great turning of our time. To turn toward a more balanced way of life, we have to radically change the way we do business, the way we privilege certain people and ideas, the way we relate to all beings. These planets of revolution and transformation are not done influencing the ways we are rethinking these very things. Under such revolutionary influence, even mild transits like the conjunction of Venus and Mars in Aries at the end of February 2015 sparked dramatic change in my life as I began to leave a 30-year relationship. What radical personal changes did you initiate in the spring? Venus and Mars traveled together this year for quite some time. A second conjunction occurred in August in the sign of Leo and a third in November in the sign of Virgo. These two planets have been working on changing the way we relate, the way we desire, and the way we value ourselves. The final conjunction in Virgo reminds us to bring our passions into service. Step by step, we change the world. Looking ahead, the essential transit of 2016 is the square between Saturn and Neptune. This aspect first perfected in November 2015 and will be exact two more times in 2016 (June and September). I’ve been thinking about this transit as an opportunity to dispel myths. Neptune governs our ideals and our illusions. Both are due for an overhaul. Saturn governs reality. The challenging aspect between these planets represents an opportunity to look at our stories. Stories can entrap us in false visions. As we encounter each other’s realities we wonder whose stories are valid and whose aren’t? Conflict over belief and who controls the stories is a result. Jupiter will square Saturn in March and May, these may be peak moments of conflict and integration of what we are learning about our cultural stories. In the year ahead, mutable sign emphasis means we are eager to integrate, resolve, understand. We may also experience a lot of fluctuation. Mutable signs are the shapeshifters who adapt to their environments. Nervous systems can get overstimulated by the input. While Jupiter is in holistically-minded Virgo (until September), it is good to pay attention to wellbeing and health matters as we go through the transmutations of this year. 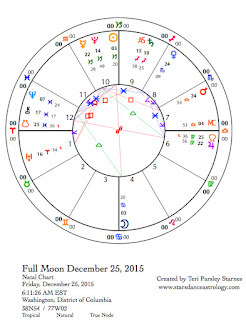 December 28—Disseminating Moon: Sharing. The waning phases of the Moon encourage reflection on the past—a perfect mood for the end of the year. The disseminating phase looks for the benefits of the past. What did we learn that we want to pass along to others? The Moon in Leo (fixed fire) reminds us to think about our creative lives. What did you create? Not everything we try is successful but everything can be meaningful. What did your failures teach you? What are the rich rewards of this past year and this current lunar cycle? The Moon trines Uranus in Aries (cardinal fire). How have you changed the world? How have the changes in the world changed you? This favorable aspect encourages celebration. The current lunar cycle has been a complex blend of hope and sorrow. Wherever your heart is right now, begin to share your wisdom. Tuesday, December 29. Mercury is preparing to station retrograde on January 5. Today, Mercury in Capricorn (cardinal earth) makes the first of three squares to Mars in Libra (cardinal air) that will happen in this retrograde cycle. Communication may be charged. Mercury means business; Mars is more concerned about how we are relating to each other. Signals will get crossed; relationships will be stressed. This aspect between Mercury and Mars is one of the signatures of the upcoming retrograde. (Dates to remember: Mercury stations retrograde on January 5, stations direct on January 25, and leaves the retrograde zone on February 14.) As the Moon moves into Virgo (mutable earth), the desire to bring more order could add to the stress. On the other hand, bringing a bit more order into our lives could bring more calm. Balance is the key. Venus, the bringer of balance, is moving out of Scorpio into Sagittarius. We feel more balanced when we see the big picture and can align with our values. Wednesday, December 30. Don’t be so hard on yourself. The Moon in Virgo (mutable earth) supported by the Sun and Pluto in Capricorn (cardinal earth), and challenged by Saturn in Sagittarius (mutable fire), influences our expectations for improvement. They are big. We are already thinking about our resolutions for next year. It isn’t about perfection. Thursday, December 31. New Year’s Eve. The Moon in Virgo (mutable earth) contacts stationary Jupiter conjunct the North Node of the Moon today. Jargon, I know. This means that things feel larger. Events in our lives and in the world carry a stronger sense of destiny or fatedness. The Nodes of the Moon are about our evolving lives. Right now, Virgo is an important sign because the North Node and Jupiter both occupy this sign of virtue. Virgo’s virtue is about making a difference, being of service, healing, finding the pragmatic solution to life’s mundane problems. Virgo is a humble sign, usually, but today we may see the reason there are no unimportant signs, especially this one. All this influences the way we will greet the new year in the morning. Let’s get it together and make this a year that counts! 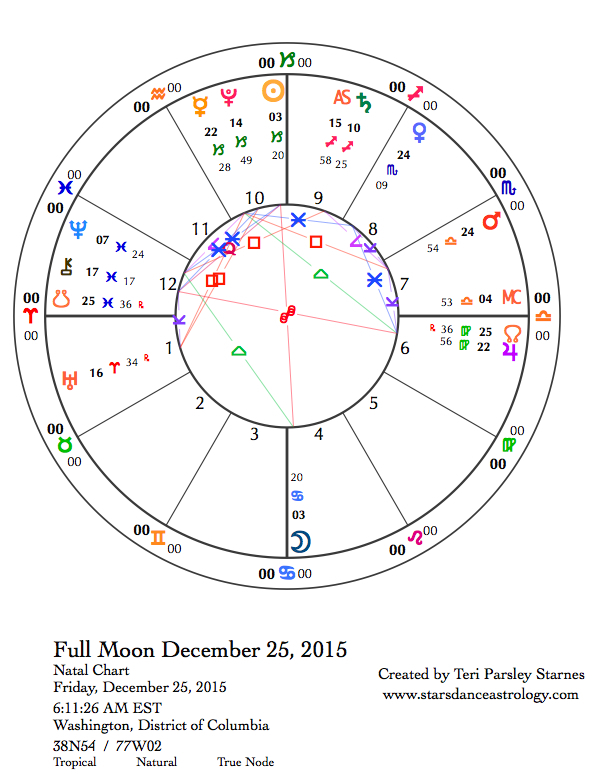 January 1 —Last Quarter Moon: Evaluating. The waning phases of the Moon encourage reflection on the past. What did that experience mean? We are feeling especially nostalgic as this new year begins. The first day of the New Year is a chance to look over the past year and create intentions for the year ahead. The Moon in Libra (cardinal air) has us thinking about balance. Justice, grace, and beauty are influences as well. 2015 began with the Moon in Taurus. What did you notice about the substance of your life? Did money, values, resources play a big role in your year? Did you seek stability? Did you stand for something important? Another year brings another point of view. How are you a different person than the one who greeted 2015? How are you a different person than the one who greeted the New Moon on December 11? The impetus to move out of the past and into the future comes from Mercury’s ingress into Aquarius (fixed air) today. Mercury is preparing to station retrograde on January 5. As a fixed sign, Aquarius, can get stuck on ideas. Mercury may be planning to shake up some of our entrenched thoughts during this retrograde period. What happens when we free our minds? Saturday, January 2. The Moon in Libra (cardinal air) forms a tense t-square aspect pattern with Uranus in Aries (cardinal fire) and Pluto in Capricorn (cardinal earth) bringing a potential for upheaval. We need to be engaged in the world to create lasting change. Libra’s themes are noticed—equity, rebalancing, justice, weighing the choices, finding the harmony (if possible). Uranus has just stationed direct and is as close to an exact square to Pluto as will happen for a very long time. These two planets are a reminder that we are not done with the transformations needed right now. The holidays are over; time to get back to work making sure those changes happen. Sunday, January 3. The Moon and Mars both move into Scorpio (fixed water) at almost the same exact moment today. This could go one of two ways: you feel terribly excited to sink deep into whatever drives your passion right now, or you are feeling so overwhelmingly annoyed with everyone that you better spend the day by yourself. A channel to those deeper passions opens up. Mars is co-ruler of Scorpio. The planet of desire and will is so happy to be out of Libra (cardinal air) that we may be surprised by intense emotion as well as desire. Mars remains in Scorpio until the beginning of March. But there is a bigger story brewing. Mars will return to Scorpio through retrograde motion from May until the beginning of August. Passions will deepen. We will discover much that is hidden from us now. A climate accord was signed in Paris on December 12, which could mark a real shift in the ways we think about our choices and impact on the Earth. Reactions to the agreement span the continuum of thinking the plan is too much to not enough. According to the New York Times, a leading American climate scientist, Christopher B. Field said, “I think this Paris outcome is going to change the world. We didn’t solve the problem, but we laid the foundation.” In the current Sagittarian/Capricorn lunar cycle,* when we are so acutely aware of the paradox of simultaneously holding despair and hope, this assessment feels both somber and like good news. There is plenty of evidence to support the belief that collectively, humans are incapable of tempered, wise decisions. To hold out hope that we can change the course of our relationship to the Earth feels rather foolish right now. And yet, if ever there was an astrological signature that encourages us to find the silver lining, believe in the impossible, and aim for the stars, it is Sagittarius. We have one more week to lift our hearts in hope; the next sign to influence this lunar cycle, Capricorn, demands more realism. Every sign is necessary. Those astrological signatures that feel inaccessible to us are especially important to integrate into our lives. Those signs expose blind spots and invite wholeness. If you have a problem with hope, spend more time observing Sagittarius. If you have a problem with sober reality, spend more time with Capricorn. This isn’t to say we should be satisfied with the climate agreement or think our work is over. The question I am holding is, What role do hope and despair play in making my next choices in creating the world of beauty and justice? What keeps me stuck? What moves me forward? The ongoing square between Saturn in Sagittarius and Neptune in Pisces colors our perceptions right now. Saturn brings that sober reality right into our dreams for a better world. Neptune continues to weave its spells, offering both illusion and greater empathy. Jupiter in Virgo (until the summer of 2016) invites discernment. This week, the Sun in Sagittarius makes a square to Jupiter, inviting a confrontation between pragmatism and wild hope. If we step away from either/or-good/bad thinking, all kinds of new states of awareness open up for us. These mutable signs encourage integration and flexibility. To integrate paradox—hopes and despairs—we need to make more room in our minds and hearts. I tell myself, “Cultivate wonder. Be curious rather than attached to outcome.” If I can achieve that this week, I will be doing good work indeed. December 14—Crescent Moon: Beginning. Aquarius (fixed air) is another sign that can give way to bold thoughts of hope. To be accurate, this sign can also be incredibly cynical, but I think cynicism is just the disappointed side of hope. Belief that the future holds hope is still an Aquarian foible. The Moon in Aquarius catches the fever of hope in this phase of the lunar cycle. It’s OK; every sign is necessary, right? Hope is sometimes scary for those of us who think disaster lurks around every corner. The Sun in Sagittarius (mutable fire) forms a square to Jupiter in Virgo (mutable earth). This square intensifies current tension and conflict in the realms of hope and despair. Jupiter itself is all about hope (ruler of Sagittarius), but in the very pragmatic sign of Virgo, this Jupiter is confused about which aspect of his personality to exhibit. More confusion, more stress, more anxiety about choice and direction could result. On the other hand, another option is to discover a workable way to hold your hopes and despairs in balance. Mercury in Capricorn (cardinal earth) is making a favorable aspect with Neptune in Pisces (mutable water). These two planets work together to help us stay both grounded and expansive in the realm of thought and inspiration. Heart-opening insight can come your way. Tuesday, December 15. The square between the Moon in Aquarius (fixed air) and Venus in Scorpio (fixes water) may get us started on the cranky side this morning (CST). Venus is not in the mood to suffer fools. Welcome the challenge of authentic emotion as you plan to change the world today. Later the Moon makes favorable aspects with Uranus in Aries (cardinal fire) and Mars in Libra (cardinal air), creating an eagerness for change that is hard to stifle. Wednesday, December 16. The Moon enters Pisces (mutable water) around noon (CST) and makes no aspects with any other planet for the whole day, in the CST time zone. Use this time to recharge and release tension. 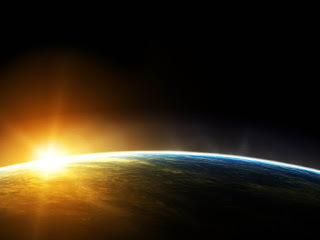 The concerns of the world are still happening but we have the opportunity to refocus where we place our attentions. Pisces invites softening our focus. Not everything needs to be done immediately. Sometimes we need to unplug and exhale. Take those moments today. Self-care pays dividends. We may notice grief or despair arising when we slow down. Stay present and enfold yourself in compassion. Thursday, December 17. An adjustment between sober reality and fantasy is made today. Neptune is one of those planets that has so much to give and represents so many of our shortcomings. What I mean is that we have the opportunity this year to reclaim Neptune’s power to connect us through our hearts and spirits by dispelling the myths of isolation, escapism, and disappointment. Accepting the vulnerability of grief is important work while Saturn in Sagittarius (mutable fire) forms a square to Neptune in Pisces (mutable water) this year. These themes may be noticeable today as the Moon in Pisces makes a connection to Neptune and Saturn. A lot of planetary energies are woven together. Venus in Scorpio (fixed water) forms a sextile aspect with Pluto in Capricorn (cardinal earth). Venus demands honesty and authenticity around emotions and especially in the area of relationship. The power of healing and transformation is strong if we are willing to show up completely. Mercury in Capricorn is an intermediary in negotiations. Be grounded in your values and aspirations as you speak. December 18—First Quarter Moon: Manifesting. In the practice of holding mindful intention for this lunar cycle, I have committed to holding the paradox of hope and despair. Under this phase of the Moon, we have the opportunity to begin changing our realities through manifestation. The result of holding the paradox of hope and despair begins to show up in choices and attitudes. How am I different? How has the world changed as I begin to tell a new story? We reach a turning point today, not just because the Moon in the last degrees of Pisces (mutable water) forms a square to the Sun in the last degrees of Sagittarius (mutable fire). The Sun also forms a square to the nodes of the Moon, which are currently in Virgo (mutable earth) and Pisces. This point is potent. The nodes describe a growing edge of evolution. With the North node in Virgo and the South in Pisces, we are given the opportunity to reframe our beliefs, our wounds, our despairs into pragmatic service. In other words, we have a choice—learn from grief and act in accord with those lessons. Wholeness does not mean perfection. Virgo wholeness means we accept ourselves wholly and get on with our work, whatever that is. Be gentle with yourself as this is a big integration and we have several more months of the nodes transiting through these signs to figure out what it means to each of us. Today’s transits could reveal a lot about our healing and integrating journeys. This afternoon (CST) the Moon enters Aries (cardinal fire). Later, Venus in Scorpio (fixed water) makes a quincunx to Uranus in Aries. Tension and irritability may be present in our relationships. On one hand, righteous rage creates certainty about our actions; on the other, we have to negotiate mistrust and power dynamics in order to get clear about how best to make those changes. Quincunx aspects remind us of complexity. Nothing is simple. That is good. Saturday, December 19. Cardinal signs push agendas. That may be why squares and oppositions between cardinal signs can be fraught with conflict. Today’s transits include a lot of such aspects. The Moon and Uranus in Aries (cardinal fire) push the agenda of bold action. Change for the sake of change, conflict around identity, even aggression can be part of the Aries agenda. The other side is courage to act, taking responsibility for leadership, and encouraging self-expression for everyone. Mercury and Pluto in Capricorn (cardinal earth) join forces to communicate expectations, claim authority and power, and frame reality through stories of legacy and tradition. The shadow side of Capricorn exudes judgment, disapproval, and a need to control. As these planets trigger the best and worst in each other, we see the dynamics between individual action and collective expectation. Is there a way to find balance here? Sunday, December 20. Yesterday, the communication planet, Mercury conjoined Pluto in Capricorn to bring structure and power to our thoughts. Today that Mercury forms a square to Uranus in Aries, taking the power of structure into the innovative realms of possibility and change. The Mercury/Uranus energy can feel like uncontrolled electricity. How do you channel your overactive mind into productive insights? The Moon in Taurus (fixed earth) provides grounding for this electric transit. It is good to remember that the body has ways of knowing too. Listen.